Last night I watched an old episode of the Chris Carter show, Millennium. The episode started with a church in Tacoma and a priest being burned at the stake. Of course it wasn’t really filmed in Tacoma. And the only reason I could see that they set it in Tacoma was due to its proximity to the main character who lives in Seattle (though the whole show was filmed in Vancouver). My point here is that the episode could have started just about anywhere and nothing would be different. This isn’t true with Joshua Swainston’s debut novel, Tacoma Pill Junkies. Tacoma Pill Junkies has Tacoma in its veins. 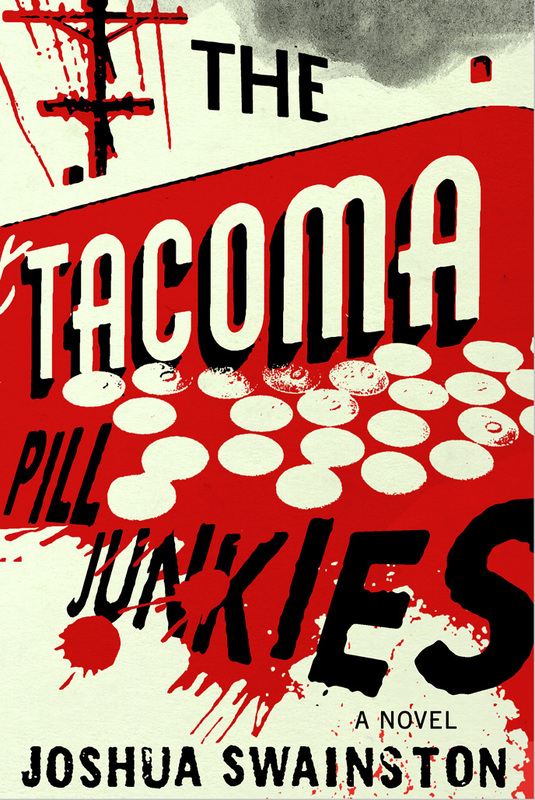 I first became aware of Tacoma Pill Junkies when I saw a poster downtown for it months ago. I’m someone who enjoys reading and writing crime novels and this site can attest to the fact that I love Tacoma. So a crime novel set in Tacoma is really something I have no choice but to purchase. If you’ve spent enough time in Tacoma, you’ve met people like the characters in Tacoma Pill Junkies. There’s the hard working single mother. There’s the working man who gets high from time to time. There are the scheming junkies. And the loser with delusions of grandeur. If nothing else, Tacoma Pill Junkies is populated with authentic characters. It’s difficult to pin down the plot of Tacoma Pill Junkies as it actually has about three or four inter-connected plot lines with overlapping characters and events. This too, feels so much like Tacoma to me that I can’t help but enjoy it. A woman gets robbed in the Tacoma Mall Parking lot. A guy starts selling his grandmother’s pain pills. A serial killer is strangely stalking and killing janitors. These unrelated things drift through the novel occasionally bumping into each other along with a few other subplots. Swainston’s writing is conversational and inviting. He doesn’t spend too much time on being overly descriptive. His dialog is witty and full of humor. He also manages to convey the thrill of the high along with the underlying desperation of being a pill addict. It’s never glamorous. For locals who enjoy a good novel, Tacoma Pill Junkies belongs on the shelf next to Mark Lindquist’s King of Methlehem. For those outside of Tacoma, I recommend it as a glimpse at part of the underbelly of our fair gritty city. This entry was posted in Books, Tacoma Books and tagged Joshua Swainston, Tacoma Books, Tacoma Pill Junkies. Bookmark the permalink.